Queens of the Stone Age is a rock band from Palm Desert, California, United States. The band is frequently labeled stoner rock, although they reject the label. QOTSA developed a style of riff-oriented, heavy music which the band's founder and mastermind Josh Homme described as 'robot rock', saying that he "wanted to create a heavy sound based on a solid jam, just pound it into your head". Since then, their sound has evolved to incorporate a variety of different styles and influences. While in high school, Josh got together with locals Brant Bjork, Chris Cockrell (later replaced by Nick Oliveri) and John Garcia resulting in the formation of Kyuss (firstly known as "Sons of Kyuss"). 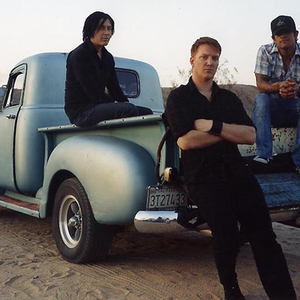 QOTSA formed in 1997, rising from the ashes of Kyuss and began playing together during the now legendary Desert Sessions. Homme has drawn all of the members from that diverse group of musicians for QOTSA. The band originally formed under the name Gamma Ray, but almost faced a lawsuit from the European metal band of the same name. QOTSA have gone through many line-up changes since first breaking into the hard rock scene. Their most recent line-up includes: Josh Homme (Guitar, Vocals), Troy Van Leeuwen (Guitar, Lap Steel, Keyboards, Backing Vocals), Joey Castillo (Drums), Michael Shuman (Bass, Backing Vocals) and Dean fertita (Keyboards, Guitar, Backing Vocals). Josh Homme and Nick Oliveri were seen as the only two consistent QOTSA members. Being friends since childhood, the two meshed well together. Oliveri's punk background brought an element of danger and attitude to the Queens' live shows. His unique "howling" singing style made him easily distinguishable on songs such as "Six Shooter" from the album Songs for the Deaf; however, he also displays a more melodic singing style in Rated R songs such as "Auto Pilot". After recording three albums and six years of touring with QOTSA, Oliveri exited the group in early 2004 due to a conflict between him and front man Homme. He allegedly developed a pattern of destructive behavior that Homme couldn't handle. Homme stated: "Everywhere we go, Nick is a like a whirlwind passing through. And I'm sick of being the one that has to clean up the mess all the time." Josh claimed that he was fed up with Oliveri's disrespect towards their fans and the destruction that he caused at gigs. However, a year later, Homme told Zane Lowe from BBC Radio 1 that he and Nick had actually fallen out over several third party claims that Oliveri was violent towards his (Josh Homme's) girlfriend (an accusation which Nick strongly denies). In 2005, QOTSA released their first album after Oliveri's departure, "Lullabies to Paralyze". Homme has also produced an album for Millionaire, organized the Desert Sessions and contributed to various other projects such as Chris Goss' Masters Of Reality and the recently formed 515ers. Homme also runs the label Rekords Rekords, which has released Likehell, Fatso Jetson, Mondo Generator and his musical improv series Desert Sessions. He also plays drums in and produces Eagles of Death Metal, along with his friend Jesse Hughes. Currently he recently produced the new Arctic Monkeys-album. Now he is fronting the band Them Crooked Vultures.